PICTURE CAPTION: Here’s one Shropshire Self build project to be finished in 2016. A new year’s gift to those wishing to make their Shropshire self-build a reality or for those wanting an alternative way to get on the property ladder has come in the guise of free, monthly meetings led by regional property experts. 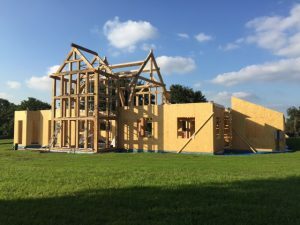 Real-life examples at the monthly forums include how a Shropshire cottage was designed and built to a budget of just £100,000 as well as information about self build building regulations. Sarah Pugh, Director of Renovate Me said: “It’s no secret that the UK is in a housing crisis; with the population predicted to hit 70 million by 2027 there is a significant housing shortage. The Government target is for 240,000 homes to be built each year to meet demand but with less than 120,000 homes built in 2014 the stats alone tell us we’re failing miserably. Covering topics from self-build regulations to real life self build examples as well as an open forum to ask experts the questions would-be self-builders need answers to – why not take your step to self build in Shropshire a touch closer in 2016? PYC Systems Ltd are a building material distribution company delivering and supporting class leading insulation and intelligent vapour retarder products. Speaker Steven Manterfield of Approved Inspectors Limited will provide an insight into compliance with the current building regulations. Next Post What happens if HMRC disagrees with 5% VAT?